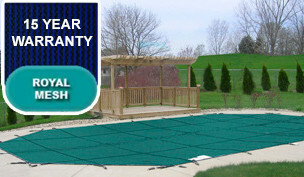 PoolTux Royal Mesh Safety Cover with it tightly woven mesh gives your pool affordable protection with uncompromised quality. Dirt and debris are kept out and yet still allows water rain and melted snow drains right through making for an easy spring opening. PoolTux is so confident in the Royal safety cover; they stand behind it with a warranty the other guys only give their high end covers.